Ive been looking all over the net and havent seen any, have you? 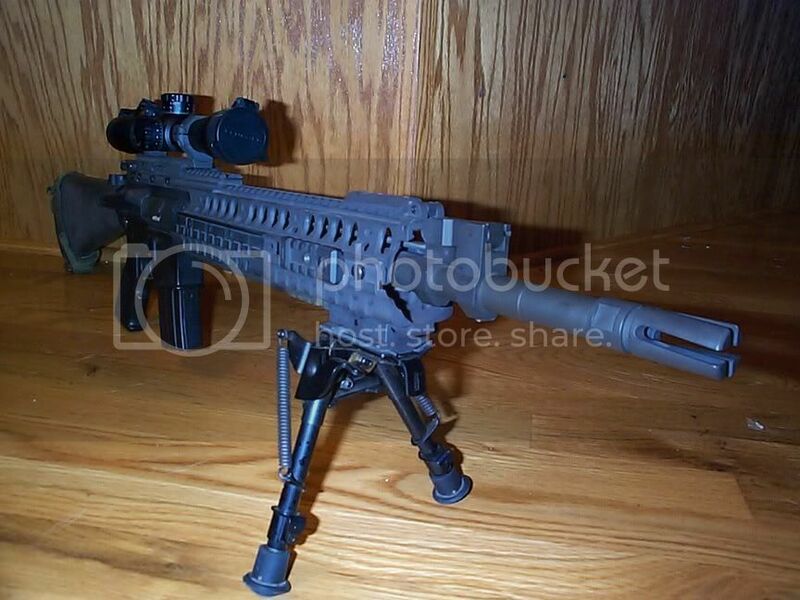 An SPR bult using the ARMS rifle length SIR system. Post links or pics please. I would be interested in seeing this too. 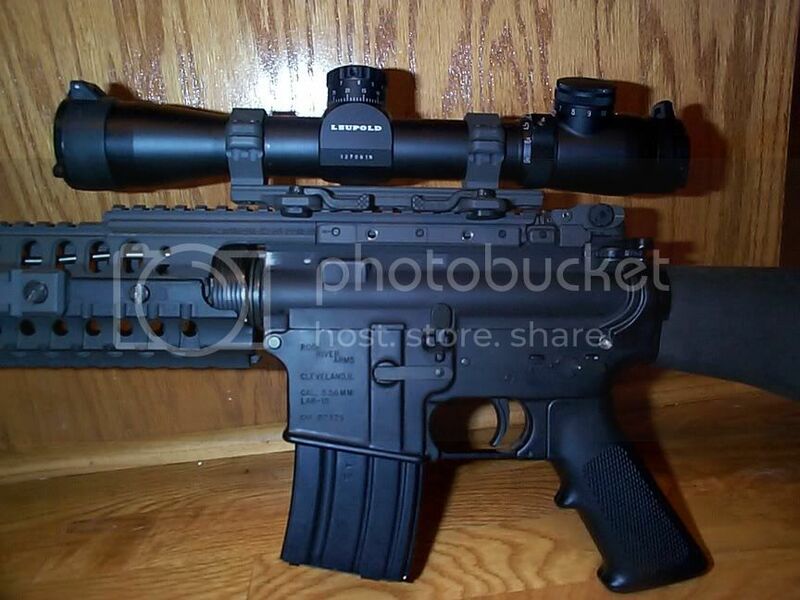 Because I'm not going to wait for the NFA nonsense I would going to try to "fake it a little" by using a 14 or so inch barrel and perm mounting a vortex to make up the length to 16"; then I was going to try a rail system that goes slightly over the FSB area where I could put a flip sight up on the top of the rail. I was thinking the slightly longer handguards with the slightly lowered barrel length (from my 16 with the vortex on it) would make it look stubbier. Well I just heard that a new Mk12 Mod2 would be using the ARMS SIR rifle length, but somehow Knights got involved with Crane in delaying parts for the Mod 2 to be completed. Now I'll build one before they are actually introduced. So I called it first! Wow... I've either missed something really big, or you have some seriously mixed up info. Make a few calls to industry dealers and probe for the answer. Insiders at Knights know people at Crane who "word is" delayed barrels so ARMS could not make the Mod2. If you see it hit the market heres where you heard it. My big mouth. I just dont like the Mod1. The Mod0 is much nicer. The Knights rifle length doesnt cut it for me. I want something new. The rifle SIR will be next, I have heard! Here are some pics of my rifle length S.I.R. I went with the civilian model because I plan on taking it to Iraq with me. I know, that doesn't make sense, A civilian model for military use. Its the only freefloat handguard I know of that only requires a screwdriver to install on a stock M16A4 with no mods to the weapon. If it wasn't for that I would have gone with the military model. I'm not going to call this rifle an "SPR". Although the barrel is an "SPR" contour. Have you ever wondered why they call it a "Special Purpose Rifle"? Shouldn't it be called a "General Purpose Rifle" or "Multiple Purpose Rifle". The Barret M82A1, the M24, and a Silenced .22 rifle are "Special Purpose rifles". Here's a litte about what I think of the S.I.R. Fix the pics. I want to see. As far as I know, based on some input from people in the know, the SPR program is dead. The last few of the Mod 1 SPRs with KAC rails were built and delivered some time ago and no more were being built. It may have changed, though. pixs are fixed, I hope. if there are any other angles you want, let me know. Think they're going to the Recce now instead? Hey jb7032 how do you like your MR/T doing some hard thinking about to drop the cash for a MR/t with a TM rectical illuminated. Being an "insider" at Knights (VP of Military Operations) I can assure anyone interested that what is quoted here is absolutly not true...in fact it can't even be true. I mean even if we did somehow "delay parts for a supposed Mod 2" could this posssibly affect the Navy from buying SIR systems? Add to that, that if Crane wanted to build Mod 2's with a different free-floating rail forend like the SIR, then they would not need any parts from KAC anyway! MWS Forend Sling Swivel Adapter (97027). 2-Stage Trigger...then how could the "non-availability of any these have the cause & affect posted here by Sabre 223? Last week we delivered a small quantity (less than 50) sets of our Mod 1 parts to Crane. They were in fact late, and their new SPR (either "new" or possible re-furbishment of existing SPR's, I don't actually know that detail even though I'm "inside") building program had been under s "Stop Work Order." With the required parts "in hand," now the program is moving again. And just for the record, KAC only provides those components I listed above to the Navy for their Mod 1's, we do not build any SPR's. That is done by Crane under contract to someone else in that part of the Country using GI M16A1's, their own match barrels of choice, gas block, rings, scopes, etc. I have heard nothing about a Mod 2. Though it would not surprise me that some user groups have spec'd out a different configuration possibly specifing SIR's. This is fine as long as they did a good Sole-Source justification to avoid advertising their needs under the element of Law refered to as "free and open competition,"and can live with a new system totally un-supported by the Supply System. I mean all the forend's do is allow for a free floating barrel and provide Picatinny rails for accessories. This is a very generic capability, and therefore should be solicted openly. I mean there are other rail solutions out there...PRI, DD, LaRuue, Troy, etc., should all be given these opportunities if you can no longer accomplish the mission with what you already have in the system. I mean even KAC, we have SPR length URX's for just that sort of mission creep. However, Crane has stated no interest in the URX because its not either of their standards (i.e., PRI Carbon Fiber or KAC Free-Float). I probably spent too much effort on correcting Sabre 223's miss-information here, but I know those of you who possess some objectivity and have a professional interest in SPR subject matter will appreciate an "insider's" straight scoop. 1. I did not start this thread to sling mud on anyone or spread false info because of #2. I just wanted pics for me to make the decision on which way my build will go, Mod0 or My Mod?. 2. Then, pickup the latest edition of the "Surefire presents G & A AR15 special edition magazine" and read in the last paragraph of the SPR article about the latest testing of the SPR using the SIR rifle length forearm. I dont think G&A would write that if there was no validity to the comment! Which is what got me calling people. Being a professional interrogator it was easy to get answers or what I needed to hear. 3. Coldblue, I then called several un-named companies and asked to speak with persons having the knowledge who co-oberated some of this info. Also word I "heard" was that KAC Mod1 was not as liked as the PRI Mod0 by the troops, which I would think would upset KAC. After reading your posting it appears to be on the defense. Isn't there someone at KAC whos has a direct tie or good "real close" friend at Crane? I wouldnt just make things up to see how fun it gets. If the SPR project(s) is dead...its dead, or stopped for parts resupply. Anyway to the guys supplying pics (excellent), THANKS. I have seen all kinds of bad info in Guns and Ammo and the Surefire edition specifically. I dont know enough to say if what you read was false, but I can say I've read bad info from that magazine, but have not heard bad info from Dave. If all the info in front of me is what I read in Guns and Ammo and what Dave told me, I would tend to side with Dave. G&A is one of the worst for incorrect info. Sabre223 - thats some of the WORST info I have heard spewed in a while. SPR's from what I was told are getting replaced on an as needed/wanted basis - by Mk11's and "other 5.56mm" configured guns. Keep in mind they never saw major distribution being a USSOC item. SIR's dead - move along. Sabre 223, the surefire rag-mag you reference is not a magazine per se, but an advertising vehicle plain and simle...and it so states in the fine print at the front. The publisher met with us at the Shot Show and wanted to produce a similar KAC version...we told him (among other things) that we though such a format was misrepresentation. But worst than that, most of the info (like the quote from the un-named source you reference) are in as deep a retile defilade as you seem to be. Coldblue, actually all this leads me to plan my build using the PRI tube and parts as the original Mod0 was. All the info I have read and heard leads me to believe all (edited to say) "this industry" is tainted. Thanks for the real info. I have the mag. It is basically a Surefire infomag for Surefire's products and how Surefire is trying to corner the market on weapons lights, accessories, and suppressors and cater to the LEO and Military market. They make good products but they are not the only ones in the business. They are the only ones who have paid Guns & Ammo for special magazine space. You can build any SPR with any tube you want. The SPR might be dead in the military ideas, but any gun you build can be called a SPR. SPECIAL PURPOSE RIFLE. The first SPR was a bolt gun. Goggle the SPR and look hard you will find info on the term SPR way back. So build your SPR the way you want it to be. Here is a pic of my SPR the way I wanted it to be. Here is what it can do at 100 yards using 75 gr Blackhills HP's. Note 1/9 twist barrel. I like the SIR, but I decided I just want the original MK12 Mod0 clone. Very nice gun! Like the mag as well, but for an SPR a 20 or 30 will do it for me. Shot placement wins every time. Excellent choice (much more better than the long SIR). Dave Dunlap's PRI carbon fiber tubes are our envy. You are also smart to dublicate a "real deal" like the Mk 12 Mod 0. I think down the line, the more historically correct a piece is, the more it will increase in value and the prouder you will be with in on the range...always nice to have a piece of authenticity. Of couse you can more than double the value of your SPR if you have both a Mod 0 and a MOD1 side-by-side in your gunsafe. As far as "tainted" is concerned, I think you need to consider the source of such comment as to "friends" and "insiders", I mean some of these guys are just sore loosers with sour grapes. So one of these loosers prints a totally unsubstanciated remark from some ignorant rock-ape, and some people than bet their money on it. Is this stupid or what? I will never apologize for our company (KAC) winning so many fair and open Solicitations as we have over the last 10 years (starting with the RIS, Mk 23, M4 QD, BUIS, M203 QD, the M4 & M5 RAS, Mk 11 Mod 0, Gen-2 M4 QD, etc.). Unfortunately, some loosers of these competitive procurements lack the objectivity to re-look or re-think their losing entries, and spend their energies istead poisoning as many people as they can. I meet these poisoned rock-apes from time-to-time and its like talking to a wall. They have all the information they need, don't want to hear anything different (especially the truth of the matter). Maybe some people are born less objective than others, and then there is the sub-set of that group that loves conspiracy theories...I don't know. But I do know when people have been BS'd to the point that the truth is not what interests them. Go back to the rag/mag quote, I mean don't you realize that there are 10,000 happy Users of KAC equipment out there for everyone with some issue? Why are none of the overwhelming volume of good reports referenced? There are also pictures of our GI products in many of the picutres that are not identified as such. I could go on and on, but hopefully I have made my point. But I can tell you that there are no former US Government Civilian employees on the payroll here out of 257 employees. There is just me (Ret'd Lt.Col. in 1991), a long Ret'd Lt. Cmdr. (who was in no way ever associated with System Acquistion (he has only been here for about 14 months), and a newly Ret'd M/Sgt USMC, also never associated with system acquisition, but is a hell of an Armorer. So where are all the former Gov employees with the high paying jobs here on the beach in Florida? There just ain't none. Fact. I imagine that anyone interested could obtain (Freeddom of Information Act) enough documentation from any of these procurements to convine themselves that the Government Acquistion Agencies and the personnel involved have conducted themselves correctly and objectively. I think you wiill also find that like99% of those people still work for the Governemnt, none are driving expensive automobiles, living on the Beach in Florida, the Bahama's or anywhere else, but where they have always been. Even Congressional Inquiries have been found to be based on bogus BS. Now I have decide PRI natural or black. What did the first Mod0 come with?